In the sideshow that of life there are certain events that just bring out the freak in some of us, while providing entertainment for the rest of us. One such event happens every January in New York City, and in cities around the world – the No Pants Subway Ride. Imagine getting on to the subway in New York and many of your fellow passengers appear to have forgotten something. Something that you just don’t forget when you are out in public and especially not in the middle of winter – THEIR PANTS. Yes, they are riding the subway without their pants. As you can see from the photos and videos this creates a bit of a surreal moment for the other passengers, especially for those who may not be aware of this annual event. The No Pants Subway Ride was originally started in 2002 by Improv Everywhere* in New York City with just seven participants (see video at the very bottom of this page). Over the years, the No Pants Subway Ride has grown into an international event with tens of thousands of participants in more than 60 cities throughout 25 countries on six continents (to my knowledge this has not been done in Antarctica yet). The No Pants Subway Ride has been celebrated in most of the major cities of the world, including New York, San Francisco, Los Angeles, San Diego, Minneapolis, Chicago, Baltimore, Boston, St. Louis, Atlanta, Miami, Austin, Dallas, Charlotte, Portland, Seattle, Salt Lake City, Philadelphia, Phoenix, Washington DC, Honolulu, Toronto, Montreal, Calgary, Vancouver, London, Paris, Lyon, Berlin, Hamburg, Munich, Stuttgart, Basel, Stockholm, Helsinki, Copenhagen, Amsterdam, Brussels, Rome, Milan, Barcelona, Madrid, Lisbon, Bucharest, Warsaw, Vienna, Budapest, Prague, Istanbul, Cape Town, Johannesburg, Bangalore, Shanghai, Beijing, Hong Kong, Tokyo, Sydney, Melbourne, Brisbane, Adelaide, São Paulo, Buenos Aires and Mexico City. The idea behind the No Pants Subway Ride is fairly straight forward. 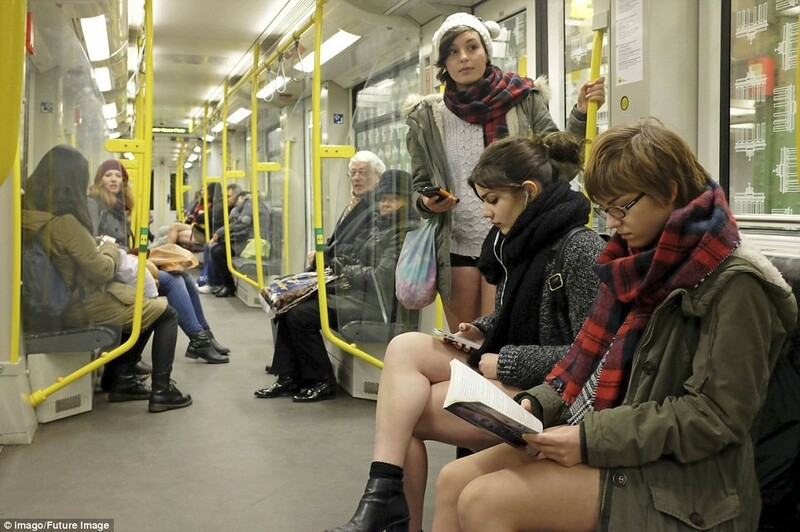 Passengers simply ride the subway (or in cities without a subway, the city’s commuter train) in the middle of winter without pants. Participants are requested to dress normally on their top halves and to otherwise act normally as they ride the subway without their pants. Yes, underclothes must be worn – only the pants are absent. Check out the photos and videos below and enjoy your virtual No Pants Subway Ride. But don’t freak out. In fact, if you happen to live in a city that has a subway or other type of commuter train and feel the spirit to participate in this event why don’t you take a real No Pants Subway Ride and enjoy the sideshow that is life. * Improv Everywhere is a comedic performance art group that is based in New York City. Improv Everywhere carries out pranks, which the group calls “missions”, in public places, sometimes using thousands of performers. Improv Everywhere was formed in 2001 by Charlie Todd who had moved to New York City after graduating from the University of North Carolina at Chapel Hill. In 2009 Todd’s book about Improv Everywhere, “Causing a Scene” was released by Harper Collins. Improv Everywhere is huge on U-Tube with nearly two million subscribers. A feature length documentary, titled “We Cause Scenes”, about Improv Everywhere was released in 2013. This film can now be seen on both iTunes and Netflix, as well as, on other platforms. Improv Everywhere has been featured numerous times in both the national and international media, including The New York Times, The Today Show, and ABC’s Nightline.